Greece was immediately relaxing. It may have helped that we started from the Greek Island, Rhodes. But the culture and way of life really shined through. When I think of Greece, I think of Greek food, the Greek Islands, Greek history and then our surprising experience in Athens. 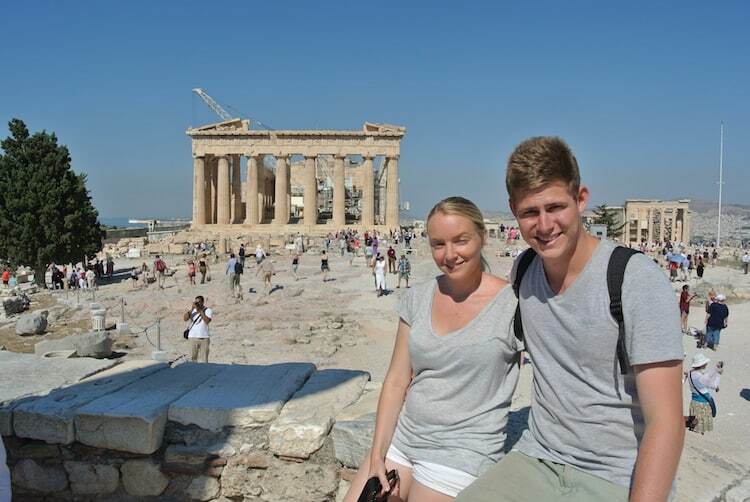 Going to Greece was definitely a memorable part of our Europe holiday. Heres our Greece itinerary, to see what we did, what we loved and what we would change next time. Arrived in Rhodes, and it was a complete contrast to Turkey. Spent the day exploring both the old and the new town of Rhodes. We spent the day seeing the sights in the old town. 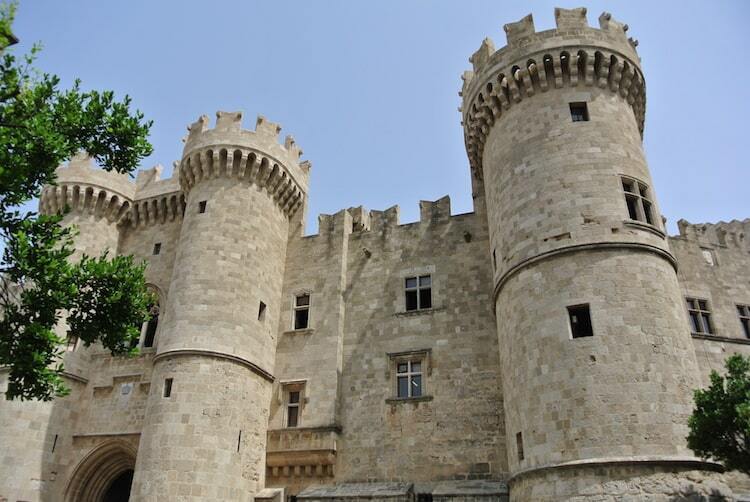 There really is so much to do in Rhodes, it’s so full of history, beautiful architecture and stunning beaches. Today we hired a car and drove to Lindos, took in the views from the acropolis of Lindos (it looks high up, but it’s not as big of a walk as it appears), got lost in the streets of Lindos, and relaxed on it’s beautiful beach. Our final day in Rhodes, Chris and I walked to the local Saturday produce markets (near Aegean Fish and Zephyros beach), had a fish lunch (Aegean Fish), swam in the beaches just outside the Gates of the old town, and explored more of the back streets in the old town. Welcome to Santorini! Today we explored Oia, where we were staying, put my feet in their first ever fish spa, and had dinner in Oia. I’m not sure why, but it surprised me that we were so far away from beaches (even though I knew we were staying on a cliff). 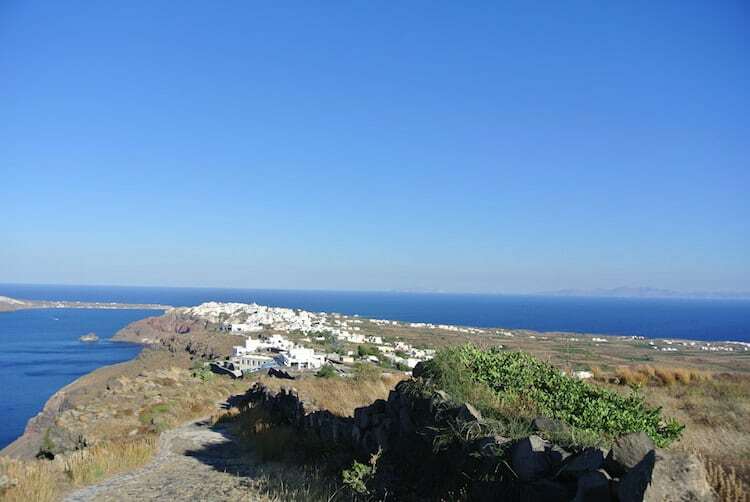 Today we did the Oia to Fira walk…it was hard without food and water (so make sure you at least take a water bottle with you), but the views/expereince were stunning. We finally ate in Firostefani, explored Fira, and back to Oia for dinner. 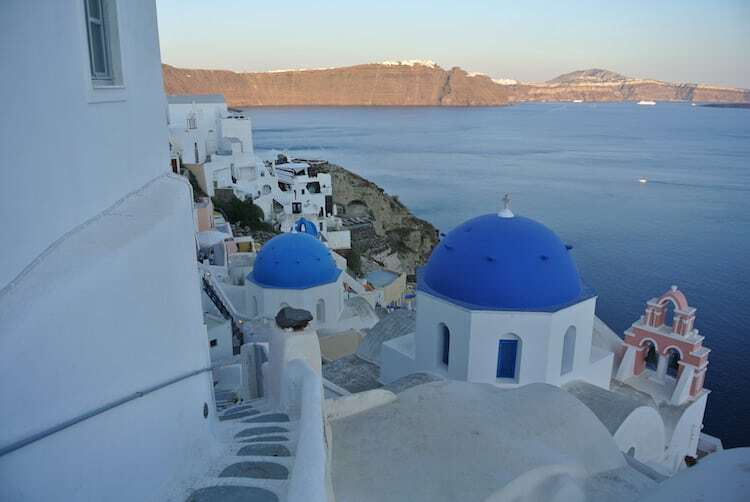 A Lazy day in Oia, walked down the stairs from Oia to Amoudi Bay for dinner just at sunset. Today we hired a car and drove all around Santorini, from beach to beach to beach, and to the Akrotiri Archaeological site (which was closed due to strike). A great way to see more of Santorini. Our final Santorini evening was spent in Oia. Even though Santorini had some really unique beaches, they were a little hard to get to, and weren’t the white sand/blue water kind. Arriving in Mykonos, with a blue water and a sea of white buildings was a huge contrast to Santorini. In that way, I think the two islands are a good combination, getting a totally different experience at each. Today we got lost in the streets of Mykonos Town (a must), a swim at the beach, a drink in Little Venice, our first look at the famous Mykonos Windmills, and finished with dinner in Mykonos Town. Yes, we hired a smart car and went off road in Mykonos! We drove, swam and ate our way around the island. 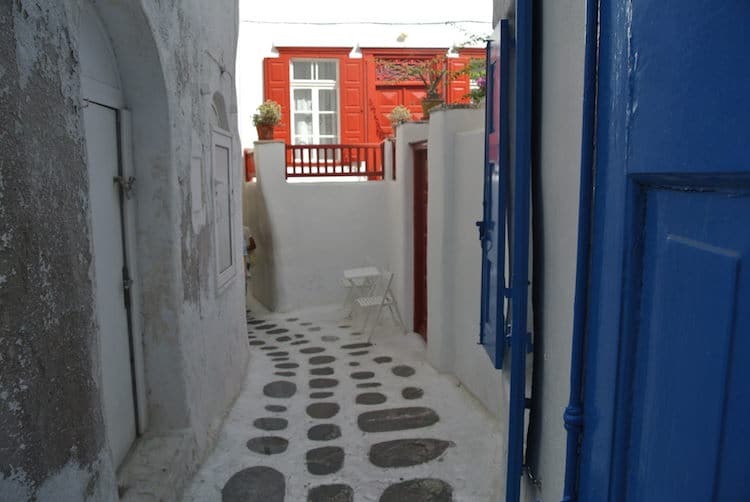 I would absolutely recommend hiring a car to explore Mykonos, because there is so much more to explore. Our last day in Mykonos, we spent exploring Mykonos Town and finished up at Paradise Beach for a drink. Hmm, so we got a ferry to Athens and lets just say there were a lot of people with sick bags. After that ordeal, we finally got to Athens and I must admit, I was a little surprised by Athens. It wasn’t what I expected, but then again, I’m not sure what I expected. After a little exploration, we went out for dinner in the Gazi district. 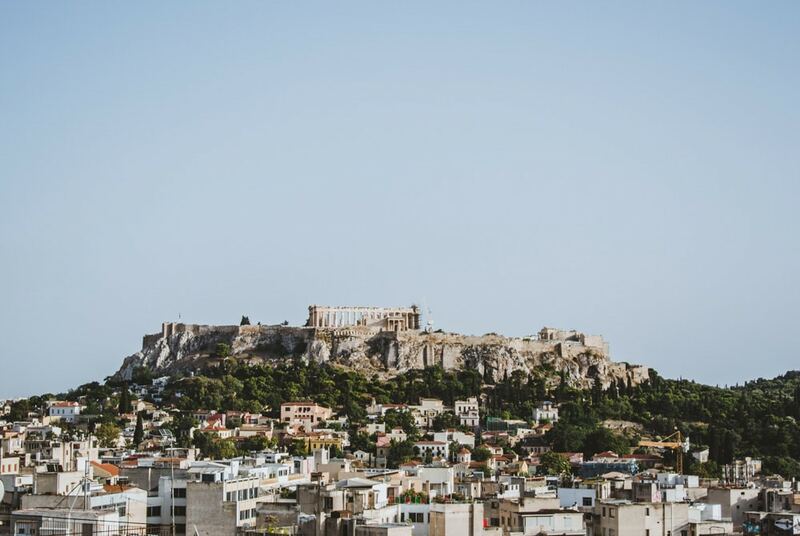 We started the day by exploring the Athens Central Market (fruit, vegetables, meat), walking through Plaka, and then taking in the history at the Acropolis. We got completely lost in another neighbourhood somewhere in Athens, took in some street art, then had lunch in Plaka. Finished our stay in Athens with Dinner in Monastiraki. Our time in Greece has come to an end… off to Italy in the morning. I’m so happy that we spent 4 day’s in Rhodes. There was so much to see and do here, I think 4 days would be a minimum. Our time in Santorini (4 days) and Mykonos (3 days) was also a good amount, and spending 11 days overall on the Greek Islands was fabulous. Although we spent a great amount of time in the Greek Islands, we didn’t get to see much of the mainland. We really only had a day and a half in Athens, and didn’t go anywhere else. Having said that, we knew this when we planned the itinerary, and we gave up more time in Greece for more time in Italy & France, and I have to admit, I don’t regret it at all. It was the right decision for our overall trip. Next time I would love to explore more greek Islands, and perhaps some lesser known ones. I would also love to see the Meteora Monasteries. Our Greece Itinerary was great for our overall trip, which included Turkey, Italy and France. I think the main thing I learnt from our Greece Itinerary, is the need to weigh up your priorities and not try to do everything. The Greek Islands were the perfect holiday destination to relax, swim, see some amazing views and sights, and take in the history. We still have so much of the mainland to explore, but there’s always next time! Have you been to Greece? What were you’re favourite things? Or are you planing a trip? Great tips! 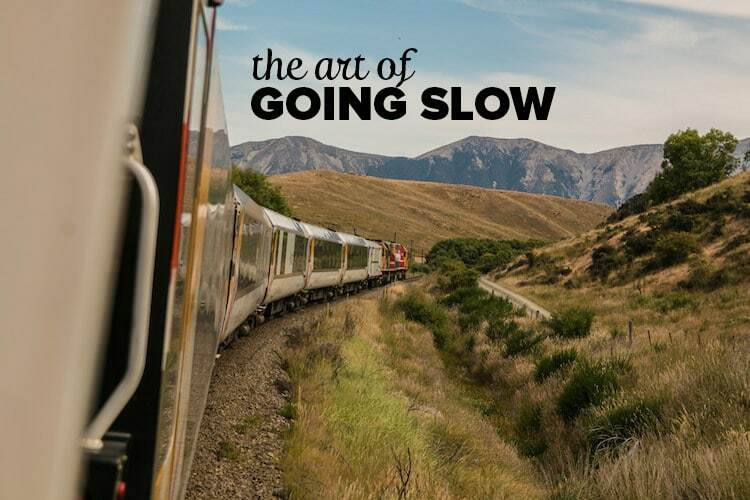 What time of year did you travel? How did you travel between all the islands? Turkey – Rhodes was by boat. Rhodes – Santorini we flew from Rhodes to Athens then Athens to Santorini. Santorini – Mykonos was by boat. And Mykonos to Athens was by boat. We were happy with all options but the boat from Mykonos to Athens was very choppy! I think that was just the luck of the draw with the weather on that day though.